If you had to pick one city in the whole of the UK where Racism and Fascism are least welcome, you'd probably opt for Brighton. Cosmopolitan, meterosexual, diverse, wonderfully tolerant Brighton, home of Naked Cycling, the UK's biggest Gay Pride Festival and a Green MP. And it hosts one of the best organised, most passionate Anti-Fascist Groups in the Country. So why do NeoNazis insist on visiting and being shamed? Okay, to be fair, the very good transport links, decent beach, pleasant Lanes and copious pubs are a bonus for various Fascist Groups ... but, and here's the point: If fascists get owned and shamed in most UK towns (which they do, always) you can triple that in Brighton, where you can always rely on locals, and various local organisations, to turn out and outnumber the Fascists. By 20 to 1. At least. And yet ... they return, fewer and fewer each visit, but they still come back for more shame. Their next little seaside jaunt is on 4th of June - and opposition is being organised here by @StopMfE. "On the 4th of June, a group of far-right racists want to protest in Brighton against refugees." "The group, calling themselves "South Coast Resistance" or "Pie and Mash Squad" say they're opposed to our city hosting any refugees whilst British people are homeless." "In reality, this is simply an excuse for their undisguised racism. These fascists don't care about homelessness, they just want to keep refugees out. The reason for the homelessness in Brighton isn't the (frankly pathetically small) amount of refugees we're taking in, it's the government selling off all the council stock, closing homeless shelters and banning squatting." "Brighton is a city that's proud of it's diversity and solidarity. We've seen off fascists many times in the past, and we will again." Here's the thing: Anti-Fascist Events in Brighton are no longer 'scream and shout and duck the missiles' affairs. Now they are 'point and laugh at the dozen drunk nazis' and 'lets have a f*cking party!' shindigs. The last such event this writer went to in Brighton ended up being a multi-cultural, multi-ethnic celebration of life. And seeing as the local Brighton and South Coast AntiFascists have a solid record of coming up to London to support events in the Capital, it would be the done thing for all us Londoners to head down there for the big party, right? Well, t'would be rude not to! Brighton Railway Station, 10:30am on Saturday 4th June. Follow @stopmfe for updates, just in case: You know how these things can change! 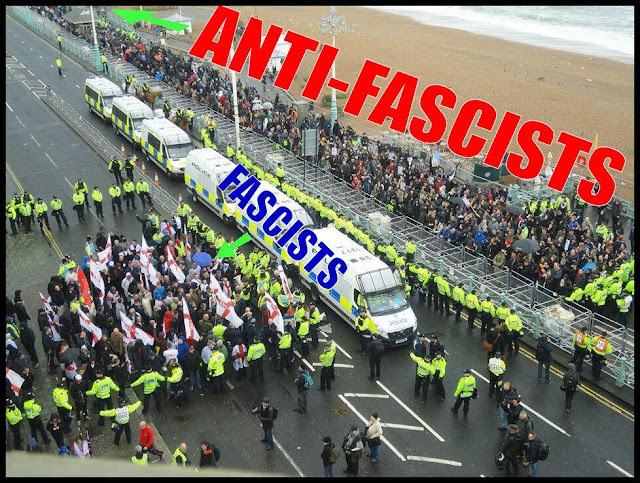 And watch hashtags #StopTheMarch and #FascistFreeBrighton.